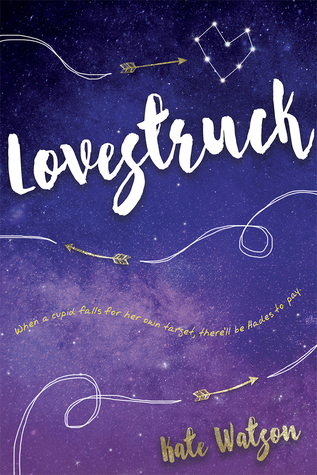 I have enjoyed Kate Watson’s previous books and was very excited for Lovestruck. While I enjoyed some of it, for the most part I think it’s a case of just not being the right book for me. I thought the first half or so of the book was kind of messy. The world-building left a lot to be desired for me. It mostly consisted of throwing out random bits of information on different characters from Greek mythology – most of whom had absolutely nothing to do with the plot. I think it also relied on the assumption that the reader was already familiar with the subject, which I’m not super into. I know there are a lot of fans of Greek mythology out there, so I can see a different audience really appreciating it. The characters were ok and sometimes humorous, which I enjoyed, but I never really fully connected to them. Another reason why this may not be the right book for me is that there was a lot of teenage, love-triangle angst. It was one of those situations where I just felt a little too old for what was going on. However, I did like how the love-triangle resolved. Just from reading the synopsis I felt like I knew exactly how it was going to play out, but once I got into the book I realized it might go down the less obvious path and I shipped it. Overall, I thought Lovestruck was an ok read, but just not for me. I think a younger audience and fans of Greek mythology will appreciate it a lot more than I did. Glad we agreed! Though I wish we both enjoyed it a bit more. For sure! I was really looking forward to it! The description sounded adorable! I have read several books more recently that are based on modern versions of Greek Mythology. I used to think I loved those stories, but I’ve gotten tired of them. I do think that’s a popular genre right now, so maybe the author is trying to go with that trend. As always, a fair review, Stephanie! I’ve read some that I enjoyed well enough, but it’s definitely not my favorite subject. Thanks for reading! My kids never liked learning about Mythology in school – I liked it but now I’m a little tired of the gods and goddesses! I read a similar book to this a few years ago with a son of Eros…felt similarly about it. Thanks for the review! It’s not my favorite subject, but sometimes they’re fun. Thanks for stopping by! This doesn’t sound like one I would enjoy, but I do love that cover. I’m sorry it wasn’t more of a hit for you. Great review, though! Thanks! I do love that cover, too! Have you read anything by this author? I think you might like Seeking Mansfield, though it also was a little too angsty at times. I haven’t. I’ll have to check it out! Thanks for the review! I think I will skip this one. I recently finally finished a YA series that involved Greek Mythology and while I liked it I don’t think I need to ever read anything that involves it again. 🙂 I think you’re safe in skipping this one. What was the other series you read? Myths Academy by Jennifer Estep. It was good but was definitely written for teens. I may try her adult series when I get in a fantasy mood. Also since Lisa Gardner’s new book is part of a series I decided I don’t want to spend $30 on a book. I haven’t read the last book in the series so I just bought a like new copy of that one and it was only $4. If you want her to sign a book, the first in the series would probably be really cheap if you don’t want to spend the $30. I don’t think I’ve heard of the Myths Academy. But I know in my current mood, it’s not one I would check out any time soon. That is a good idea about Lisa Gardner’s books! I will think about that.